Ms Kaur told BBC's One's Heaven and Earth programme: "Police need to work with the community to actually find out why is the community not reporting incidents to them and if the community has built their own mechanisms, how can the police interact with that mechanism." Many Sikh men wearing turbans and with beards find themselves mistaken for Muslims, groups say. When there is a heightened fear of terrorist attacks, Sikhs have reportedly been targeted for verbal and physical assaults by people believing they are attacking Muslims. This has encouraged Sikh groups to urge the government to make it compulsory for the police to record faith-hate crimes in the different religious groups. 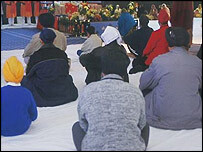 There are about half a million Sikhs in Britain. The National Secular Society called for faith-hate crimes to be broken down into different groups earlier this year. It asked if a further review of whether to record the religion or belief of the perpetrator and the victim of religiously-aggravated crimes had been undertaken. The Attorney General Lord Goldsmith 's replied in January that a review and consultation was imminent and would form part of a CPS review on information recorded on hate crime.